I just get my Non-B visa(teaching) 2 weeks ago. Now I have to apply for Teaching License. My agency just sent me this documents today? What is the documents? 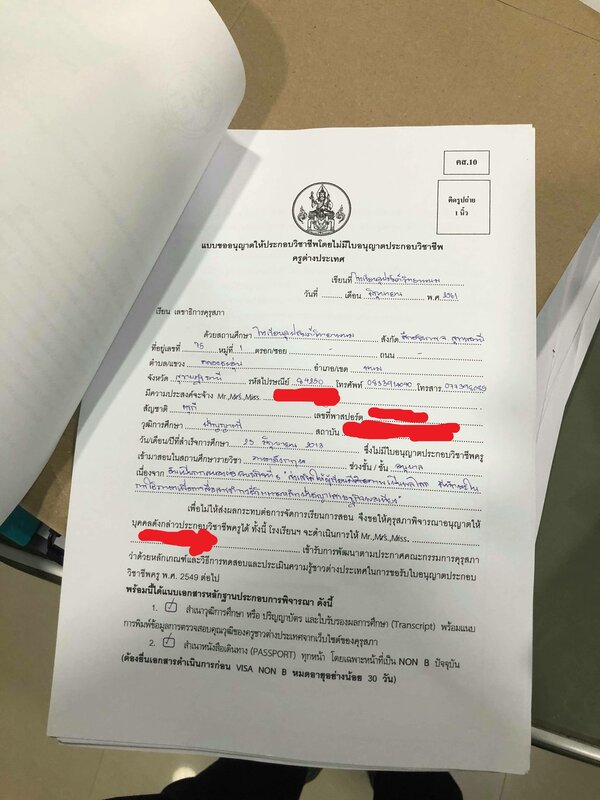 I asked one of teacher from school as she said "this documents teaching without teaching license"? I'm wandering if you have a work permit, because it's looking like you haven't gone through the Government process of getting a Teachers Lisc. I'm wandering﻿ if you have a work permit, because it's looking like you haven't gone through the Government process of getting a Teachers Lisc. So do u think this documents because of something going wrong? 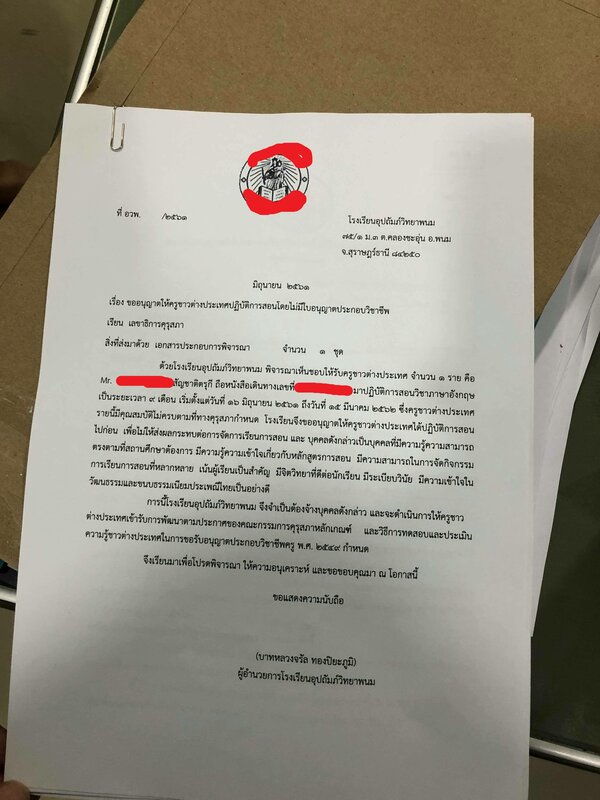 Why my agency not apply Teaching license but sent kinda document then? 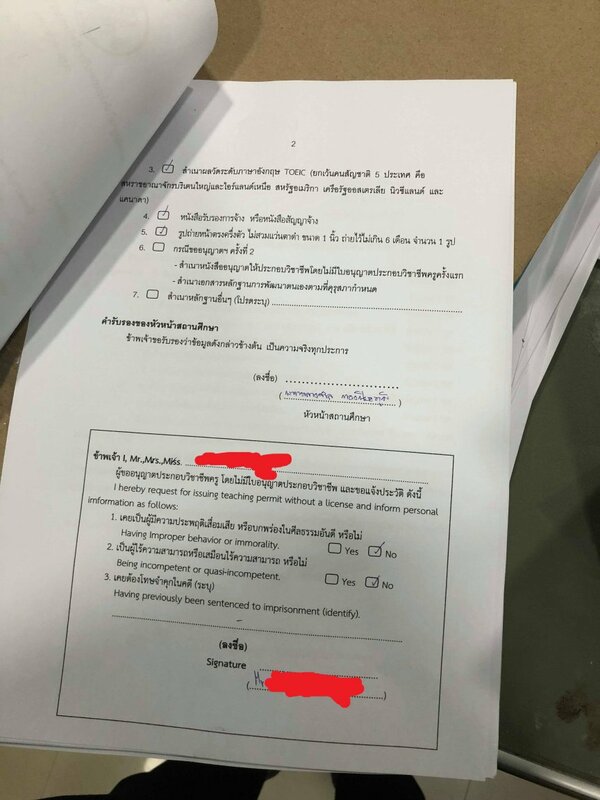 In order to teach at a school (not a language center) in Thailand you must have either a Teacher's License or a waiver that will allow you to teach for 2 years without a Teacher's License. You need a BEd or an MEd or a BA/BS + a one year certificate (PGCEi or Grad. Diploma in Teaching) or be a currently licensed teacher in your home country to get a Teacher's License. 1. Copies of your BA/BS certified by your embassy along with a transcript. (If your degree is not printed in English, you will probably need an official translation). 2. A copy of your passport with a Non-immigrant B Visa that has at least 30 days validity left. 3. If you are not from the US,UK,Australia,NZ, Canada or Ireland you will need to take the TOEIC test. I don't remember the minimum score required. 4. A copy of your contract with your school. 5. A 1 inch picture that is not more than 6 months old. Your school will have to take signed copies of all these documents and apply for the waiver for you. Yes my agency also asked me 1 inch picture, Non B visa, TOEIC copy copy etc. So r they gonna apply for teaching waiver? What’s the different between teaching license and teaching waiver? Why I can’t apply for teaching license? A waiver is an exemption from the licensing requirement, for those who can not qualify for a licence, or who are waiting for their licence application to be processed. Out of curiosity, have you written a TOEIC ? Yes I already take TOEIC. Can I apply work permit with teacher waiver? Yes,you can get a Work Permit with a waiver. Troll posts removed. Some members have no businesses poking fun at the OP since they apparently can't read and comprehend the question. Continue and face a suspension. Not everyone teaching is teaching English.